St Vincent de Paul is holding an official launch this morning at 11am for their CEO Sleepout in the ACT. 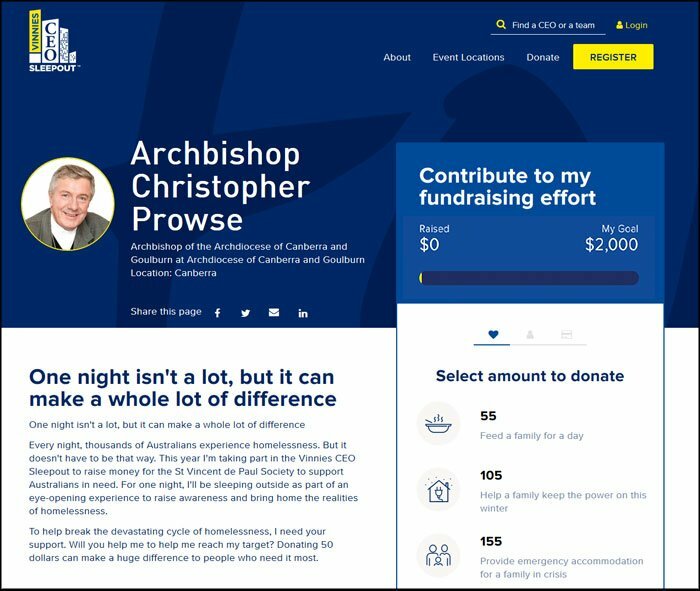 Archbishop Christopher Prowse will take part in this year’s Sleepout which is to be under the stars at the Garden of Australia Dreams at the National Museum of Australia on the night of Thursday June 21 with the sole purpose of helping to raise funds in tackling the ever-growing problem of homelessness. This year Vinnies is aiming to raise $480,000 to help deliver their services across the Canberra and Goulburn region to people at risk and currently experiencing homelessness. The National Museum, which is in Acton, on the shores of Lake Burley Griffin, hosted Canberra’s first CEO Sleepout in 2010. Archbishop Prowse said he is looking forward to his involvement. “My prayer is the hope that it will highlight the huge problem of homelessness in our country and lead to practical assistance for the needy,” he said. Bernie Fehon, the founder of the sleep-out 12 years ago, said every year participants take a step out of their comfort zone to a part of the solution and he is encouraging as many as possible to get involved either by donating money or by sleeping out themselves. “Since it began, the Sleepout has raised more than $34 million,” he said. Joining Archbishop Prowse at this year’s Sleepout so far will be Greg Hood, CEO and Chief Commissioner of Australian Transport Safety Bureau, Suzanne Greenwood, CEO of Catholic Health Australia, Prof Kylie Ward, CEO of Australian College of Nursing, Prof Michael Frater, Rector of UNSW Canberra at ADFA, Barnie van Wyk, CEO of St Vincent de Paul Society Canberra and Goulburn and Mathew Trinca, Director of the National Museum of Australia.